Fire is a critical survival need that we must address with our bug out bags. The importance of having the means to make fire cannot be overemphasized. You can either buy a pre-made survival fire kit like this one or you can make your own DIY Fire kit. Making your own is what we’ll be discussing today. It will keep you warm, dry you out, and disinfect your water. On top of that, there is a strong psychological component at work. Not only will a good campfire make us feel better about our situation, given that it helps to chase the boogeyman away at night, being able to make fire under adverse conditions is a strong boost to our self-confidence. Fire requires three ingredients—oxygen, fuel, and heat or a spark. In our fire kits, we’re only worried about the latter two components. If you lack enough oxygen to make a fire, you likely have far worse problems than cooking dinner…. When building a fire, you almost always start with tinder. This is material that will easily light from a spark or flame and will burn for sufficient time to get your kindling going. Kindling consists of sticks or pieces of wood that run in thickness from a pencil lead to your pinky or so. 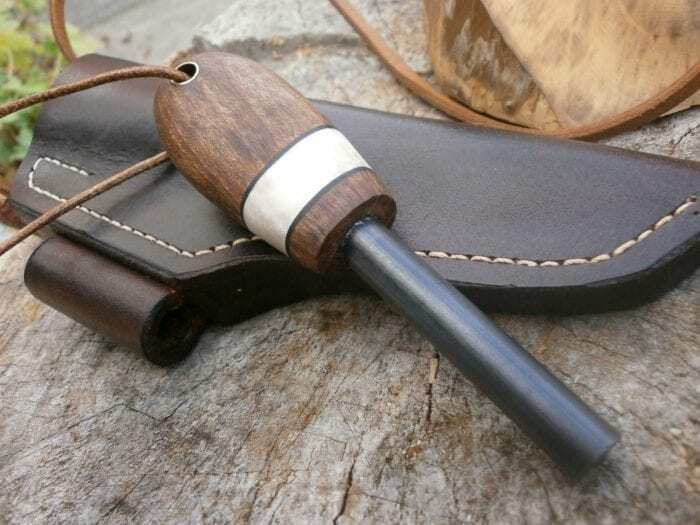 From there, you add fuel, which is generally wood pieces ranging from your finger to your arm in thickness. Obviously, you’re not going to be hauling around giant armfuls of wood in your BOB. In your fire kit, we’re only really interested in tinder. That’s the one that can be hardest to find in the wild, especially when it has been raining for days on end. 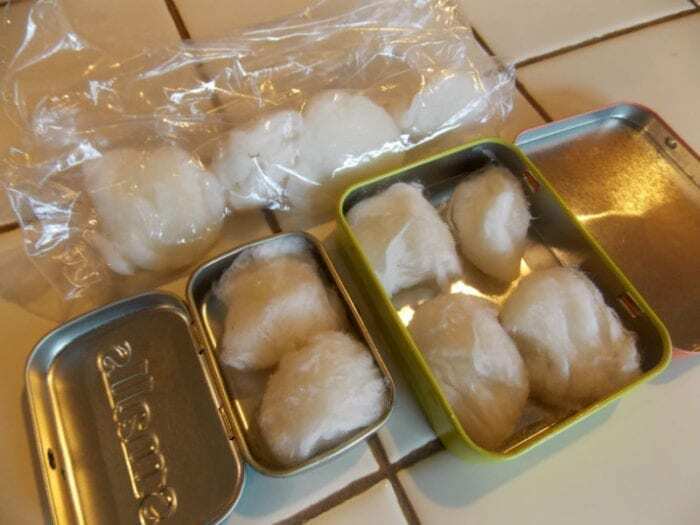 One tried and true DIY fire kit tinder is made by tossing a handful of cotton balls into a plastic baggie and adding a healthy dollop of petroleum jelly. Squish it all together until the cotton balls are soaked with the jelly. To use, take one cotton ball and fluff it up a bit, then light it with a flame or spark. They’re messy but they work very well. Wild forms of tinder include pine needles, seed pod fluff, wood shavings, and pine pitch. Commercial products that work well include InstaFire, WetFire, and Zombie Tinder. I like to keep a variety of tinder in my fire kit. For example, I’ll have a few WetFire cubes along with a small vial of InstaFire. That said, always use natural sources if they are available. Reserve the supplies in your fire kit for when you absolutely need them. The other element that needs to be present in your fire kit is the heat or spark necessary to light the tinder. Now, learning how to make fire with a bow drill or other primitive methods is all well and good, but every survival instructor I know will reach for a simple Bic lighter in a true emergency. It is instant fire and will light any form of tinder you have available. Opt for the brand name lighters, too, not the cheap knock-offs. The three-for-a-buck ones at the gas station tend to not last very long when compared to the slightly more expensive brand name models. I keep two disposable lighters in my fire kit. Two is one, one is none and all that. Take a small piece of jute twine and tie it around the lighter, just under the button. This will prevent the button from being pressed accidentally while in your kit. Plus, jute twine makes a decent tinder when you separate the fibers and fluff it up. I prefer a ferrocerium rod over strike anywhere matches but really that’s just a matter of personal preference. A ferro rod is a length of metal that, when scraped with a sharp edge, will emit a shower of sparks. Even a thin ferro rod will give you hundreds of fires. If I’m lighting a fire around the home, such as in the fireplace in winter or burning brush in the backyard, I’ll usually go with a ferro rod rather than a disposable lighter or matches. I’ll admit I just find it fun to see those sparks fly from the ferro rod. There are two basic methods to using a ferro rod. The two components at work are the rod and the scraper. The first method is to hold the scraper immediately adjacent to the tinder and then pull the rod toward you while holding it tight against the scraper, directing the sparks down at the tinder. The other method is to point the ferro rod at the tinder and move the scraper down the rod toward the tinder. There is no right or wrong here. The only real difference is that if you aren’t careful with the second method, your scraper could disturb the tinder by hitting it as you reach the end of the ferro rod. Most ferro rods are sold with a scraper but any sharp edge will do, such as the spine of your knife (provided it is a true 90°). The downside to a ferro rod is if you don’t have a scraper, it isn’t going to do you much good at all. Strike anywhere matches aren’t a bad back up in your fire kit. Keep them in a waterproof container, of course. I like the Exotac Matchcap, personally, though if you have access to old 35mm film canisters, those work just as well. You may need to cut the matches down a bit, though, to get them to fit in the film canister. Make double darn sure they are actual strike anywhere matches, too. Many stick matches look similar and the boxes can even be all but identical. One more tool or device commonly used to light tinder is a spark lighter, such as the nanoSPARK (read our review here) or its predecessor the Spark-Lite. These work very well on tinder that readily takes a spark. I look at them as miniature version of ferro rods with built-in scrapers. A fire kit should be carried in a waterproof, or at least water-resistant, container. Otter boxes, pelican cases or similar containers work great. They keep the fire kit components all in one place and nice and dry. Many of the containers intended to use to keep cell phones protected when kayaking or boating make for great fire kits. A simple, budget-friendly approach is to just use Zip-loc bags to protect the components and keep it all together in a fanny pack or belt pouch. Fire kits can be rather fun to assemble and use. Be sure every bug out bag has one and consider making extra kits for each vehicle as well. Above all, though, practice using the components in your fire kits. Learn about different fire lays and the purpose(s) of each. Try making fire when it is raining or snowing. Learn how to use a platform to keep your fire off the wet ground. Remember, disasters don’t tend to happen when the weather is beautiful. Do you have your own DIY Fire Kit for your Bug Out Bag? Let us know what you prefer to carry!